This casserole is a hit with my whole family. 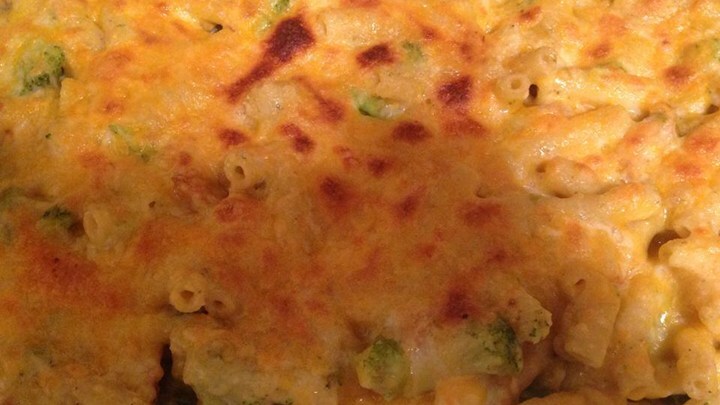 Even my children enjoy eating their broccoli with this homemade meal. Dovetailing tip: Brown 2 pounds of ground chicken. Remove half, cool and refrigerate to use on Day 5 in the Egg Foo Yung. Bring a large pot of lightly salted water to a boil. Add rotini pasta and cook until al dente, 7 to 10 minutes. Drain, cover, and set aside until needed. Melt butter in a saucepan over medium-high heat, and stir in 1 tablespoon olive oil. Add 1 cup broccoli; toss and cook just until tender, about 5 minutes. Sprinkle broccoli with flour, and cook 1 minute. Stir in the chicken broth, and bring to a boil. Pour in the milk, and stir to blend. Season with salt, pepper, and chipotle pepper powder, if desired. Reduce heat to medium, and simmer mixture until sauce thickens, 8 to 10 minutes. Mix in 1 cup Cheddar cheese and stir until melted. Remove from heat. Heat the remaining 2 tablespoons olive oil in another large skillet over medium-high heat. Crumble the chicken in the skillet and brown, about 10 minutes.. Stir in the onion and remaining 1 cup of broccoli. Season to taste with salt and pepper. Reduce heat, and cook until liquid is reduced, about 5 minutes. Preheat oven broiler to High. Lightly grease 9x13 inch baking dish. Toss the pasta with the broccoli sauce until evenly blended. Stir in the sour cream, if desired. Stir the broccoli sauce mixture into the chicken mixture. Spoon into the prepared baking dish. Top with remaining 1 cup Cheddar cheese. Cook under preheated broiler until cheese melts and browns around the edges, 3 to 5 minutes.